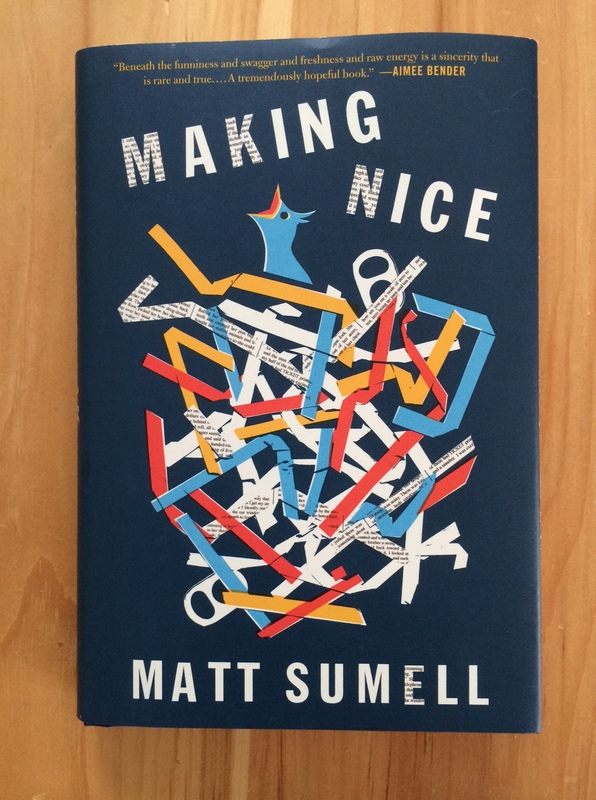 When I finished Making Nice*, Matt Sumell’s debut novel-in-stories, I couldn’t stop thinking of it as a bildungsroman, even though the narrator, Alby, is about thirty. I think that’s because we can come of age not once, but at least three times: when we physically and, to some extent, emotionally “grow up” (the fodder for the archetypal bildungsroman, like Great Expectations or Jane Eyre), when we meet our own children, and when our parents die. This last sense is speculation on my part, for which I am very grateful, but I can imagine the jarring sense of being alone in the adult world that would accompany the grief over a parent’s death. Making Nice is about how Alby deals with his mother’s death from cancer—not very well, it turns out—but at the same time, it’s about his whole life, his family, his environment, and his choices. It’s a bruising account of that final and terrible kind of growing up. On paper, Alby is not a sympathetic character: he drinks to violent excess, he steals pain medication not meant for him, he fights, he’s often contemptuous and belligerent toward women. He’s prone to egregious lapses in impulse control. However, in Mr. Sumell’s capable hands, he is very much a whole person: studded with flaws more visible than most people’s, but a man of blistering emotions who demonstrates a profound capacity for empathy. The book’s structure—linked stories—is ideally suited to conveying the complexities of Alby’s character. Rage and humor sit uncomfortably close to one another, and the result is great writing, even if it’s sometimes difficult to read. This is a compassionate, humane book, and I recommend it. Hmmm, this character you’re describing reminds me a little bit of the main character in The Hour I First Believed by Wally Lamb, although the circumstances of the plot are different. That character takes a long time to grow up, too. I haven’t read that one (actually, I don’t think I’ve read anything of his since She’s Come Undone, which was one of my best friend’s all-time favorites). Did you like it? Yes and no. It took a long time to warm up to the character, and the narrative was very unfocused and went all over the place. This book sounds great, and I loved that interview! It’s so true that “bad choices make for good stories”. I like characters that are a mix of good and bad, and struggle with making the good come out more than the bad. I have a brother who has fought all his life to do just that. For some people, it’s just not easy. Exactly! Once I read that, I realized that it’s universal–it’s impossible to think of a good book (or a good character) without bad choices. Anyone who didn’t make them would be insufferable.